We have been building up to this for weeks now, and whilst no one could argue that Korea wasn't a chaotic and ultimately brilliant weekend, it's to Brazil that we turn our attention and our hopes for more action. A good few drivers are celebrating their home races, whilst those same five guys at the top are clinging on to their title hopes. The forecasts have been suggesting rain moving in through the weekend, but the real questions are when it will kick in and whether it will stop before the race or not. So far, it looks like mid-way through Friday will see the rain start, and no, it will not stop before the race. That's what we're thinking for now, anyway. Mark Webber is the man to watch this weekend, as he and Alonso duke it out for the lead of the championship. Fernando could win it this weekend, which means it's up to Mark to stop him. And Webber is fully aware of that. There's only one point you can go from leading, and that's back down again. Now I'm second and I need to try and get back to the top with two races to go. That involves driving how I did to get to the lead of the championship. That means top results and obviously ideally that means beating Fernando as well, he's the guy that's ahead and he's obviously in the best position out of all of us. 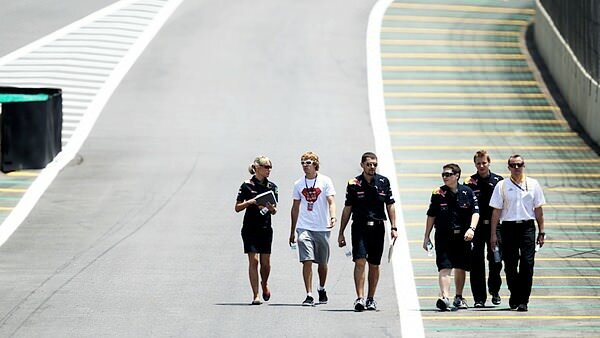 The Australian has also made it perfectly clear that he's expecting no help from Vettel, so he's out there on his own. Will we see anyone crash out this morning? Will the weather remain dry? Who will end up on top for the first session of the Brazilian GP weekend? Will Klien get to grips with his car quickly, and impress the bosses yet again?